1) Boil a large pot of water. Add macaroni and cook according to directions on package. Once cooked, drain and rinse with cold water. 2) Combine celery, parsley, onion, carrot and canned tuna in large bowl. 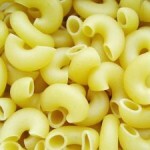 Combine with cooled macaroni and toss. In a little bowl blend yogurt, vinegar and mayonnaise and add salt and pepper to taste. Add mixture to pasta and toss. Refrigerate until ready to eat.